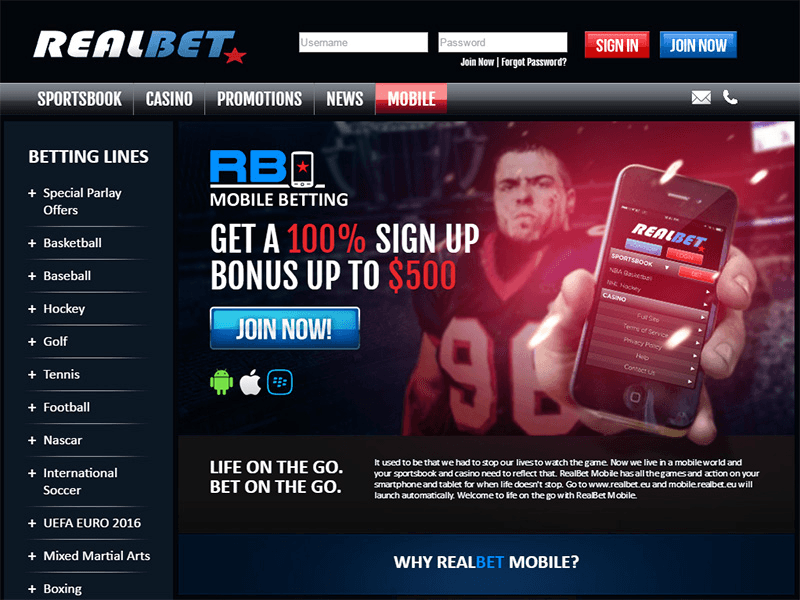 RealBet is one of the newer members of the online betting industry, in action since 2015. However, the site still provides wagering enthusiasts with a similar experience that you'll find on other sites. From the competitive sports betting odds to the various choices of casino games, RealBet is still a sportsbook for you to have in your inventory. BONUS INTRODUCTION – Make as much $1,000 from a 100 percent bonus by creating your account on RealBet and making your first deposit! Gaming Curacao is the regulatory body of the nation of Curacao which ensures that all of its gaming licensees meet its strict regulatory requirements, and it is the organization that oversees the operating license of RealBet. Their slogan says it all - U.S. Players Wanted. The first deposit bonus on RealBet is worth 100 percent on up to $1,000. If you're looking for a good sign-up bonus, then RealBet might be the right choice. There's no bonus code required. You just make you first deposit and play! For any inquiries about your account, the sportsbook, casino, or technical support, the first step is to look at the FAQs section to see if you can find what you are seeking. The site has some fairly comprehensive answers for common problems that sports bettors come across, but if you don't get the answer you need, then contact service@realbet.eu or call 1-866-839-5255 in Canada and the US or +442 030264009 outside. You can also contact RealBet through their Twitter feed. Currently RealBet doesn't have a live chat to call upon. Payout methods on RealBet are quite limited compared to other sites. The only method currently available is check by courier. The first payout that you make is for free, but all subsequent ones will come with a $50 fee. The maximum allowable withdrawal per week is capped at $2,000. RealBet is still a developing bookmaker and could potentially offer more methods in the near future. Keep on the lookout! RealBet might not appear as flashy as some other sites, but let's not forget that simplicity can be a user's best friend. Site navigation on RealBet is as easy as it gets. The tabs to the various sections of the site like the sportsbook and casino are all at the top of the page. Once you are on a page, the subsections like the different sports or casino games are located on a menu to the left. The betting lines on RealBet are fairly generous compared to other sites, which may or may not suit your betting preferences. Of course, the biggest advantage of generous odds is that you don't risk losing too much, especially if you are a fairly novice bettor. RealBet's betting lines are also quick to be posted. They are usually available the day before the game. As well, RealBet offers parlay challenges on football and every Friday from 6-9 p.m., they had a special half-price offer on parlay and teaser bets. RealBet knows that its bettors love the experience of placing wagers as a game is in action. Live betting on RealBet is likely available for your favorite sport, including NFL and NCAA Football, NBA and NCAA Basketball, MLB Baseball, NHL Hockey, and more, so you can cash in on a game that you've long been waiting for. 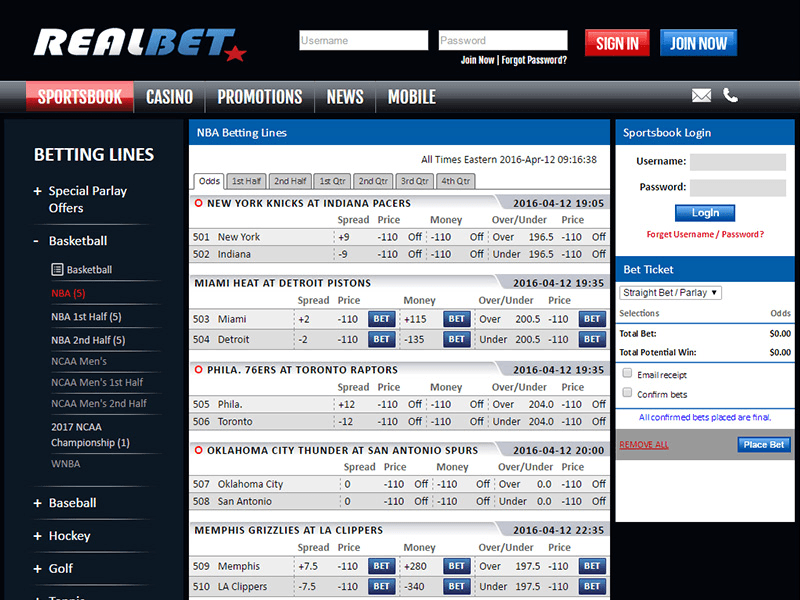 All sporting events that are available for Live Betting are listed in the drop down menus on the left side navigation. Just select a game and start betting. For a better chance at winning, check out the game previews that RealBet has to offer so that you can make a more informed wager. 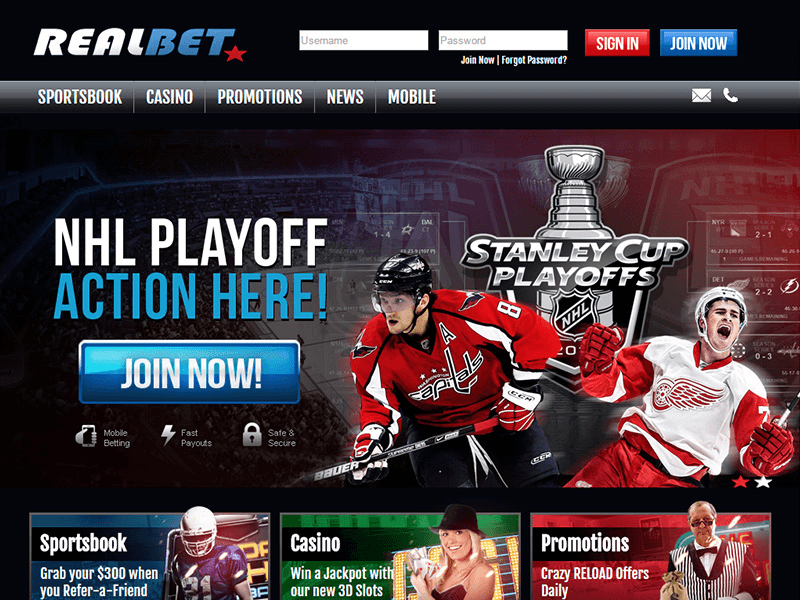 RealBet understands its sports fans very well and the types of sports they may be following. Basketball, baseball, soccer, football, hockey, golf, NASCAR - the common sports that you find on your favorite sports channel are available on RealBet. But you will also find lines offered on golf, tennis, MMA, boxing and the Olympic Games. Through props and future books, you can bet on who will win such the Heisman Trophy, the FedEx Cup, the U.S. Open and the Monster Energy NASCAR Cup. There aren't too many deposit options open to users at the moment. Currently, the only way to replenish an account is through MasterCard or Visa credit cards. You've probably used these methods at some point in the past for online shopping or other purchases, so the number of choices shouldn't be too much of an issue. Again, RealBet's site is still developing, so more methods may come in the near future. Once you have set up your account and made your first deposit, you will receive up to as much as $1,000 for free with Real Bet's 100 percent sign up bonus, but that's just the beginning. Every reload that you make after your initial payment also comes with a 20 percent bonus up to $200. Know of friends who are into online betting? 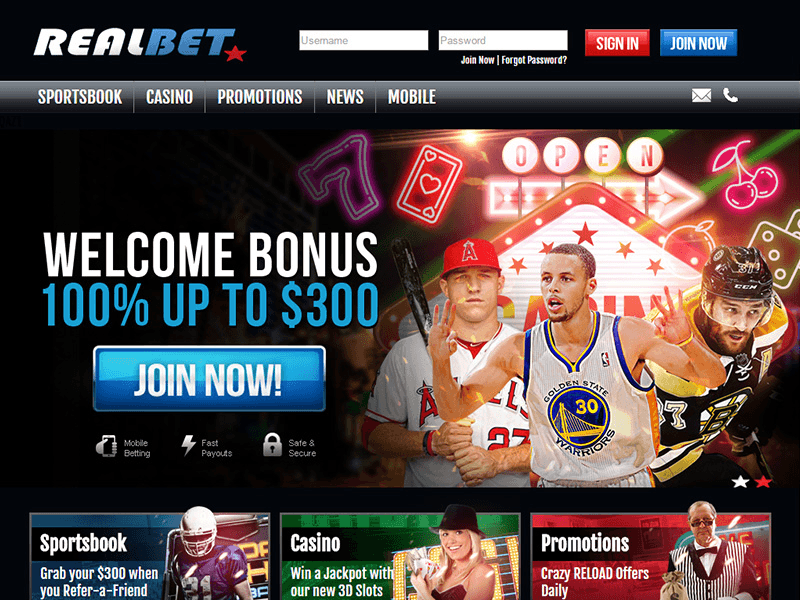 Refer them to RealBet and you will get a 25 percent promotion for up to $300. With social media so popular these days, you can even get a free $10 just by liking RealBet on Facebook or following them on Twitter and Instagram. Life is fast, and sometimes you simply don't the time in your day to sit down and watch your favorite sport or that big game. But that doesn't mean you can't have action in play. With RealBet's mobile betting platform, you will all the games and action on your smartphone and tablet for when life doesn't stop. Go to www.realbet.eu and mobile.realbet.eu will launch automatically. Welcome to life on the go with RealBet Mobile. RealBet is a good site to use if you're not too experienced at betting on sports or averse to taking big risks. Betting lines on RealBet are fairly generous compared to most other sites and the site itself is one of the easiest to navigate. The best part of the site, however, is the amazing promotions. RealBet offers a welcome bonus that is worth up to $1,000 and they are one of the few in the online sportsbook industry that offers free money just for following them on social media. They offer a parlay challenge on football games where backing five teams pays an additional 20 percent. And every Friday from 6-9 pm EST you can get extra odds on all parlay bets and get all three team 10 point teasers at half price. The RealBet casino is a first class online gambling site featuring a full suite of online casino games, including blackjack, table games, slots and 3D slots, video poker and keno. RealBet's casino software is supplied by BetSoft and Ace Gaming. The racebook at RealBet is limited, offering wagering on major events such as the Triple Crown.